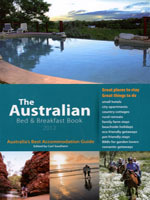 "The Australian Bed & Breakfast Book" includes over 1000 entries of Bed & Breakfast and Similar Styled accommodation from all across Australia. First published in 1989, this 24th Edition has been completely updated and revised for 2012. The publication includes full colour photographs and new maps. Hundreds of detailed entries of great places to stay are listed alphabetically by state and location with indexes including a directory of over 1000 properties. Accommodation styles include: B&Bs, Small Hotels, City Apartments, Country Cottages, Eco-Friendly Getaways, Family Farmstays, Romantic Getaways, B&Bs for Garden Lovers and Stays in Wine Regions.